The American shipyard Westport presents the new Westport 112', a modern yacht with three decks, featuring an extra wide bridge house in the stern area. There are four cabins reserved for the owner and guests, all extremely spacious, with double bed and en-suite bathroom. The owner's suite also includes an office area, sofa and dressing room. Aft on the main deck is a spacious saloon with L-shaped sofa, two coffee tables and armchairs while forward there is a dining area and spacious galley. Saloon and dining area are divided by the half deck taken up by the indoor bridge, the latter featuring latest generation equipment and controls and excellent visibility due to the wide windows on three sides. The fly extends aft to cover the cockpit completely. In the outside area there is the second control station, a circular pool, portable bar with stools, sofas, sundeck and accommodation for the tender with the davit. The cockpit is spacious enough for a table with crescent-shaped sofa and armchairs. On the side there are two ladders sculpted on the deck for easy, safe access to the stern swimming platform with stainless steel grab rod on the stern edge. For further information please contact: Westport Yacht Sales Inc.; Rusty Preston 2957 State Road 84; Fort Lauderdale, Fl. 33312 (USA); tel. 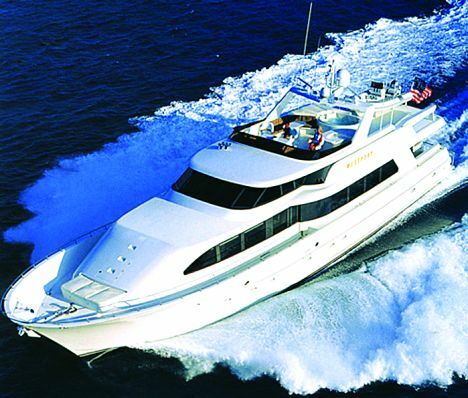 954 3166364; fax 954 3166365; web-site www.westportyachts.com. Designer: Pacific Custom Interiors Inc..